The Wet Dog Mat was designed primarily to manage overnight urine incontinence. As the dog sleeps on the mat and leaks urine, the weight of the dog will push the urine down through the top fabric layer, into the absorbent layers. The absorbent layers will lock the urine in, ensuring that it does not go back up towards the dog nor down into anything underneath the mat. Once the urine is locked in, the top fabric layer will start to dry naturally in the air. The technology of the Wet Dog Mat means that the dog is not laying in urine overnight, instead she is able to dry off quickly as the urine is locked safely away from her skin. Your Wet Dog Mat must be washed once or twice before use to ensure that the absorbency layer has been activated. The absorbency of the mat will increase over the first few washes. After 300 washes the absorbency will start to decrease. 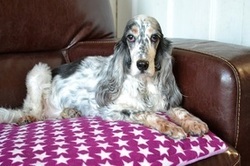 The Wet Dog Mat can be washed on a 30 degree wash with powder or liquid. You should not use any 2-in-1 powders or liquids or any type of softener. The Wet Dog Mat can be tumble dried on a cool setting or hung up to dry. The Wet Dog Mat is designed by you for your dog. 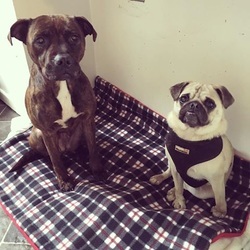 If you dog is heavily urine incontinent with big puddles being produced, then it is recommended that you purchase a mat with a polar fleece top and bottom (different colours/styles for each side). What size Wet Dog Mat should I buy? To ensure that you order the correct size, you should be aiming for your dog to laying towards the middle of the Wet Dog Mat and not on the edge. If your dog leaks large quantities, the mat needs to work hard to absorb and trap in the urine, there is a risk of urine leaking over the side if your dog is using the wrong size.. For example, a heavily incontinent Labrador using a small Wet Dog Mat could cause the urine to leak over the sides as the dog is unlikely to be laying or sitting in the middle of the mat. Brilliant for my water loving labs, have one of the mats in the boot of my car and it drains off a lot of the muck on the way home and still remains looking in good. We use the wet dog mat with our urinary incontinent dogs and have found them to be an absolute must as part of their care regime. It keep them dry, prevents sores and makes life so much easier not to have endless piles of bedding. They wash on a cool wash and soon dry and the most affected dog has one for daytime use and one for nights. Excellent product I would not be without.